atWar, formerly Afterwind, is now in BETA and it is open for everyone! Come along and see all the cool new upgrades, for instance, our new Map Editor. atWar, formerly Afterwind, a free online multi-player turn-based strategy war game - in the traditions of Risk and Axis & Allies - is now available to play in BETA. Realistic World default map based on real world populations and GDP to determine reinforcements and income from cities. City populations suffer from collateral damage when attacked, affecting reinforcements and income. Play against up to 20 people simultaneously. Make your own maps and units to provide for endless entertainment and possibilities. Free to play, also available via Facebook. In the pursuit of creating an engaging turn-based strategy game a realistic world map was taken and the 'grid' system and pre-determined paths that dictated troop movement were eliminated. Now units can move anywhere in the map based on their individual range (although land units can not go on water and vice versa). There are over 10 main land, naval and air units available with many more 'rare' units that are sometimes found when capturing a city. Having this new free movement induces complex battle sequences and demands a high level of strategy acumen. Another method to enrich the gaming experience is the use of real cities within real Countries and Provinces, rather than just regions. Cities are based on current Population and GDP statistics to determine Reinforcements and Income players receive . Furthermore city populations suffer under attacks affecting the Reinforcements and Income of the city. 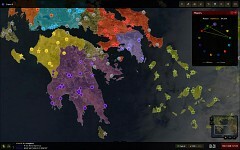 A feature sure to bring a lot of interest is the Map Editor, where players can make their own maps and units paving the way for one to Re-enact any battle in the Past, Present or even Future. 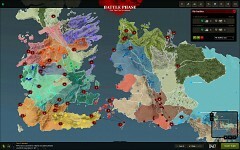 There are already hundreds of maps available that were created by members, including maps based on the Game of Thrones, Lord of the Rings, Ancient Greece and Futuristic battles for Galaxies. fair game against worthy opponents.